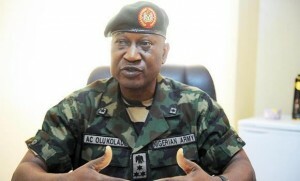 Defence Spokesman, Major-General Chris Olukolade, says ongoing operations are beginning to yield the desired results from communities in Adamawa and Mongonu in Borno State. Speaking on the ongoing operations in northeast Nigeria, he told Channels Television that coordinated assaults and counter operations are going on from all sides in collaboration with the Joint Task Force to ensure that normal sociopolitical and economy activities are restored in the country. He said that this has been the focus before the polls and will continue during the polls and after, to ensure that the enemies of the state do not interfere with state activities. The Defence Headquarters also says security forces have repelled an attack by Boko Haram militants on Gombe, the capital of Gombe State, in north eastern Nigeria. The Police Spokesman in Gombe State, Fwaji Atajiri, told Channels Television that the militants threw grenade into the Army facility, which exploded and set off an inferno, but no casualty figure was reported. Olukolade confirmed that the attacks were used to distribute materials aimed at causing voter apathy amongst Nigerians resident in the state. The West African Allied Forces led by the Nigerian military, supported by Chad, Niger and Cameroon, on Thursday stormed the Sambisa Forest in Borno State, which has been said to be the base of the Boko Haram insurgents, killing a good number of them. The forest is widely believed to host some of the training camps and facilities of Boko Haram in the North-East. It was learnt that the military high command decided to invade the vast forest in order to make the North-West safe for the general elections. Nigeria’s electoral body, the National Independent Electoral Commission (INEC) had postponed the country’s general elections, originally scheduled for February 2015, by six weeks at the request of the military to enable it improve the security situation in the northeast region before elections are conducted. The President of Nigeria, Dr. Goodluck Jonathan, on Friday reassured the international community of his determination to recover all the territories in the hand of Boko Haram as this was important for the presidential elections to be conducted peacefully in those areas. According to the President, the military’s request was not an indication that Boko Haram would be completely wiped out but all the states in the north-east still in the hands of the Boko Haram terror group would be cleaned up to enable people in those areas to exercise their democratic rights.